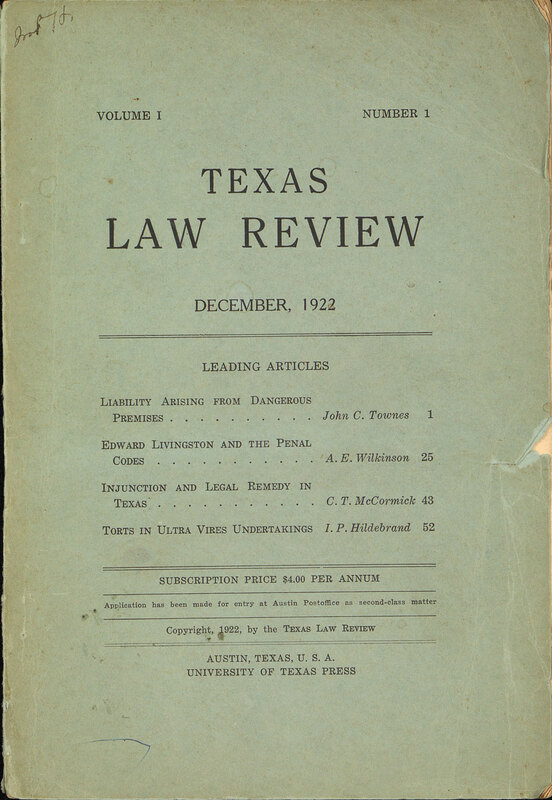 The Texas Law Review was first proposed by UT Law Professors Ira Hildebrand and Charles Potts in early 1915. Influenced by law reviews at Harvard and the University of Chicago, Hildebrand and Potts proposed the journal as a means of publishing writings of faculty members. Professors George Butte and Leon Green were hired that fall and immediately joined Hildebrand and Potts in the campaign for a law review for the Law School. It would be more than five years before the first issue was published, but the idea had the support of students and faculty from the outset. Professor Leon Green left the Law School in 1918, entering private practice in Dallas. During this time, he continued to think about the formation of a law review and developed a plan for financial support. His plan was to create a Texas non-profit corporation “for the purpose of maintaining and publishing a literary and scientific publication entitled, “The Texas Law Journal,” with an initial capital of $25,000 divided into 500 shares at $50 each.” The plan relied on attracting the interest of some of the 6,000 lawyers then in practice in Texas and drew on the popularity of Liberty Bonds used to finance the war. The corporation was not expected to pay dividends on its stock or to make any monetary return to the stockholders, but assured stockholders of a perpetual subscription to the publication. When Green returned to the Law School in the fall of 1920, discussion of a law review focused on identifying permanent funding. In agreement with Professor Green's plan, the faculty determined that while an initial capital of $25,000 would justify creation of the publication and provide initial support, the capital campaign would continue until $50,000 was raised, enough to permanently finance the law review. The plan required using interest on the capital, plus advertising and annual subscriptions, purchased for $4.00, to fund publication of eight issues per year. By July 1922, 420 shares had been sold, for a total of $21,000. 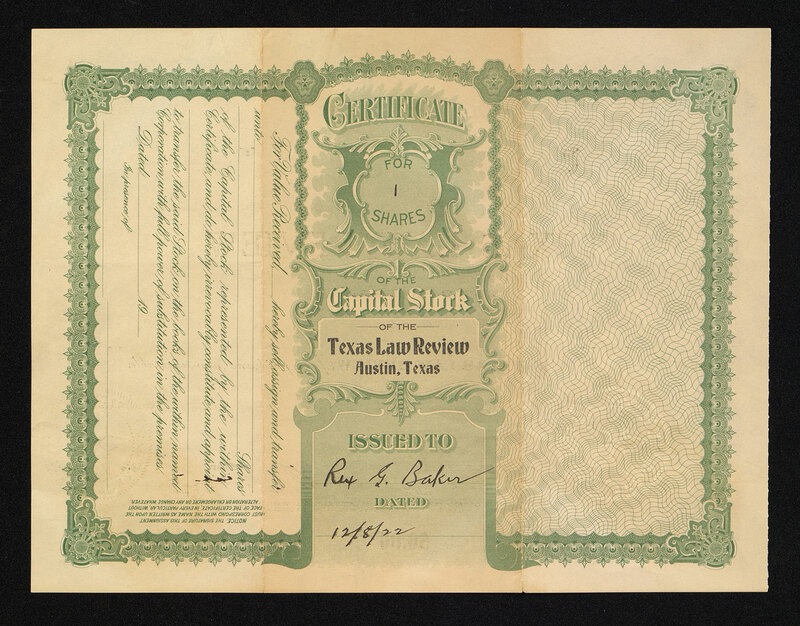 The first meeting of the stockholders was held on July 5, 1922 in Fort Worth during the Texas Bar Association meeting. A Board of Directors was appointed, consisting of William Burges, El Paso; H. M. Garwood, Houston; W. H. Shook, Rusk; B. K. Goree, Fort Worth; Walter C. Woodward, Coleman; Judge F. L. Hawkins, Waxahachie; Judge William Boyce, Amarillo; Judge Leon Sonfield, Beaumont; William Aubrey, San Antonio; Rhodes S. Baker, Dallas; Judge Ireland Graves, Austin; Judge John W. Brady, Austin; Dudley K. Woodward, Austin; Ira P. Hildebrand, Austin; Leon Green, Austin. On the final day of that Texas Bar Association meeting, July 6, 1922, Leon Green spoke to members of the Bar about the need for a law journal. Green explained the plan to permanently finance the journal, and appealed to the professional spirit among members of the Bar, explaining that a professional journal would unite lawyers across Texas. Green's speech immediately secured an additional thirty-eight sales, bringing the total shares sold to 458. Subscribers underwrote the additional forty-two shares needed to begin publication. By the time the first issue was published in December 1922, nearly 500 firms and attorneys had purchased one or more shares of stock. In November 1922, articles of incorporation were filed with the state, and the Board of Directors appointed officers, named the editorial board, and selected student editors based on their academic records at the Law School. Professor Green describes the foundation for the law review in an editorial published in the first issue, stating that “there has heretofore been no form available to members of the Bar and other students of the law for the discussion of the problems growing out of our efforts to enforce the laws and administer justice, for pointed out any weaknesses that may exist in our court procedure, for devising a more adequate judiciary system, for a frank constructive criticism of the decisions of our courts, and for suggested needed legislative and constitutional changes. Little real progress is possible in matters of such intricacy without a thorough discussion, and effective discussion is impossible without a forum.” With good financing and a grand dedication from a founding faculty member, the Texas Law Review was successfully launched. 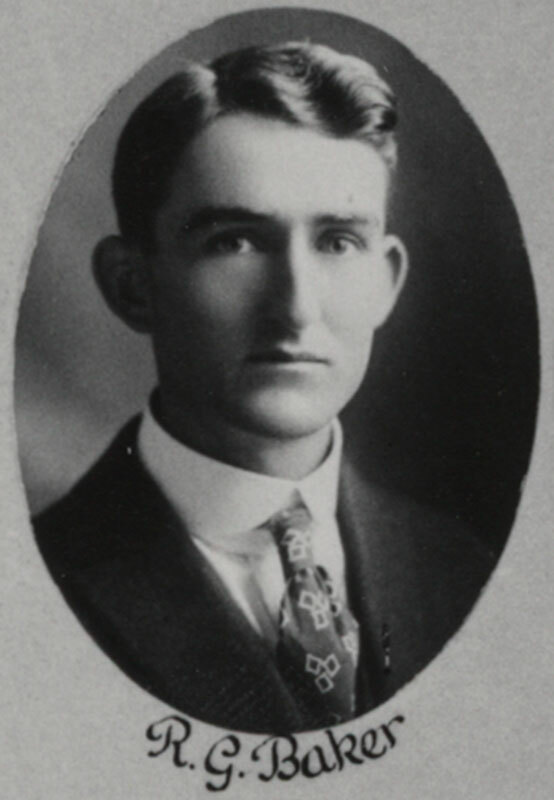 Rex G. Baker (1891-1986) was a 1917 graduate of the University of Texas, earning both an LL.B. and a B.A. He was admitted to the Texas Bar in 1916. As a student he was a member of the Chancellors, Phi Beta Kappa, and the Friars Club, as well as serving as editor of the Daily Texan. With the entry of the United States into World War I, Baker joined the Army where he served as a lieutenant colonel. When Baker purchased Texas Law Review stock on December 8, 1922, he was working in the law department of Humble Oil & Refining Company in Houston. Baker later became general counsel and vice-president of Humble Oil. In 1957, he served as Chairman of the University of Texas' Committee of 75, charged with developing a strategic vision for the University of Texas as it celebrated its 75th anniversary. In 1963, he was presented an Outstanding Alumnus Award by the University of Texas School of Law and a Distinguished Alumnus Award by the Texas Exes. In 1981, Baker was named an honorary member of the University of Texas' Centennial Commission. 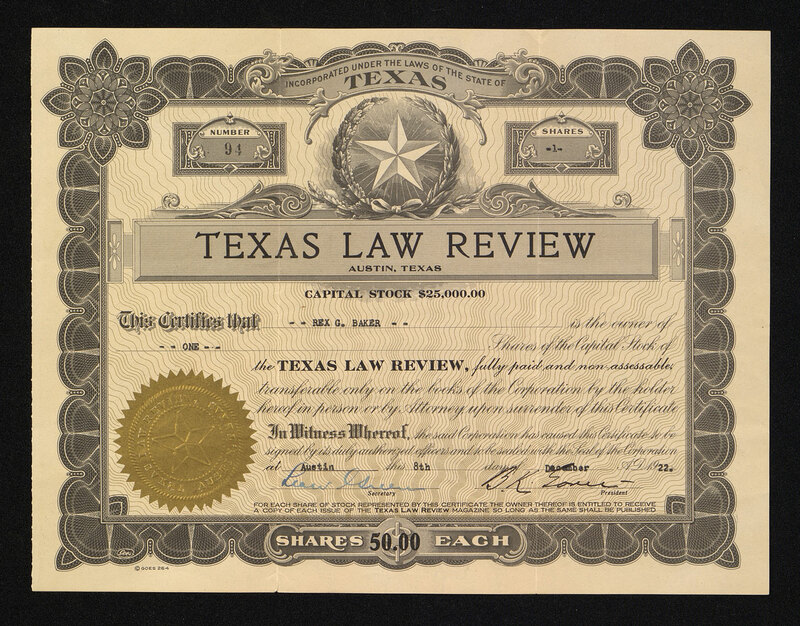 More information about the formation of the Texas Law Review is included on the Texas Law Review's History page and in John Robert Anthony’s June 1974 article, The Missing First Chapter: A History of the Formation of the Texas Law Review. The Tarlton Law Library is grateful to Rex G. Baker, III, for the gift of his grandfather's stock certificate, allowing for the permanent preservation of a document of historical significance to the Law School.